Hurrah! A few days late because of an attack of chilblains which made it hard for me to hand-sew, my 1890s corset is done. It has the flaws I always knew it would have once when I decided to try a bunch of new techniques on it, but overall, I’m quite pleased with it. What are the flaws? I bound it in a lighter fabric bonded with interfacing to strenghten it, with a single-binding rather than a doubled quilters binding, both things that students have asked me about. The result? A much less tidy binding, that was harder to do, and won’t last as long. Not recommended. I also cut my eyelet holes, rather than using an awl to stretch them – easier to put in, but they weakened the final corset. I also tried a new way of setting the cording over the busk, which was OK, and of folding and sewing the boning channels. Because it will never be perfect, I’m not going to bother flossing it. I’ll save that for a corset that I make properly. 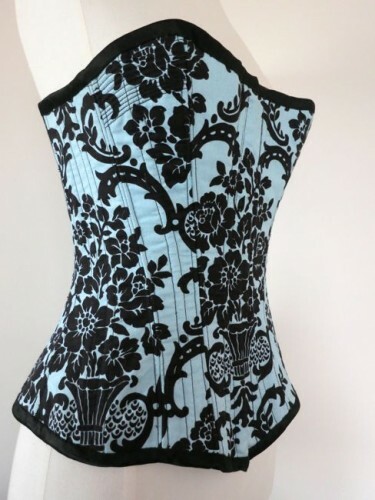 I’m calling it the ‘Midnight in the Garden’ corset, because the blues and blacks of the lining remind me of a night garden, and the oblique reference to the book and, historically, black corsets being proper, and pale blue corsets being risqué amuse me. Not quite good and evil, but my corset balances naughty and nice, both in aesthetic, and in the flawed perfection of its construction! Dang. All the people who commented on the lining as I made the corset, and when I posted it here, were right! It’s a pity it isn’t the outer! I mean, I enjoy it being my personal secret when I wear it, but it’s amazing as an outer! I wish I’d bought more fabric! I want to do it again! (and get even more obsessive with the pattern matching). And yeah, I can sort-of wear it inside out, but it’s not the same! Fabric: 3/4 metre antique Japanese silk satin (recycled from an obi) ($5), 1m coutil ($6), 1m blue & black quilting cotton ($8). Pattern: My own, amalgamated from the late 1880s corset pattern in Waugh’s Corsets & Crinolines, the 1890s corset pattern in Salen’s Corsets: Historical Patterns & Techniques, and two extent corsets in private collections. Notions: Black cotton thread, black silk thread (both inherited), busk ($32), spiral steel ($20), spring steel ($15), grommets ($10), and lacing ($15). 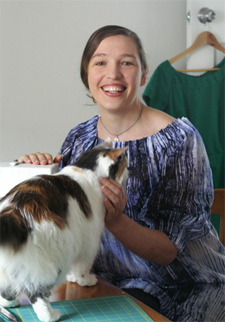 First worn: Unboned, and unbound, under my Polly/Oliver jacket, as a finished garment, not yet. Total cost: $111, though everything came from my stash and had been there for at least a year. Inside-out party would be so much fun! 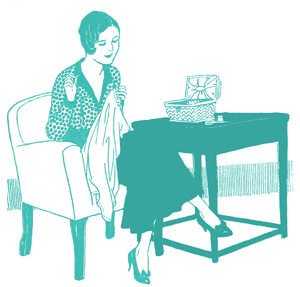 I bet that there are many people who take the trouble to get their insides as beautiful as their outsides–even if that means just seaming, if not lining. Historical Fortnightly? It’s a great idea for a challenge! Not this year though – we’re all booked out! I wonder if I have enough energy for a HSF’14? There are so many people who participated that I suspect someone would be willing to take over… unfortunately not me, because my pace is clearly not suited to a fortnightly. 😛 Maybe a monthly? Glorious! 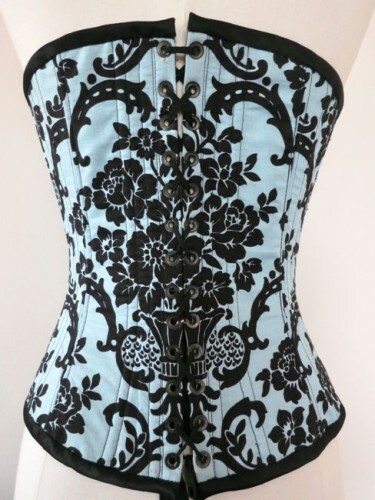 The page has definitely inspired me to start making my own corsets as I have rather a collection of ones I’ve bought over time… Just need to get the right materials and find the right style & pattern for me – oh and some free time would be nice! Free time is always the hardest! First I had lots of time, but no money for materials, now I have the money and materials, but so little time! Oh, beautiful! I hear you about the flaws, but the inside is just beautiful, and the outside is sleek and wicked. Thank you Lynne! I don’t mind the flaws too much – they were in pursuit of knowledge, rather than as the result of stupidity, and that makes all the difference! This does look lovely and I like the idea of your secret lining of fun! As always, attention to detail on your pattern matching is stunning. I’m curious as to how you bind your corsets normally, though, from reading this – I’ve been taught to use single fold bias and have used it on every project so far … Forgive me for sounding dumb and I hope it’s OK to ask, but how do you do yours with double fold bias? I’ll be dumb with you, because I’m curious, too! 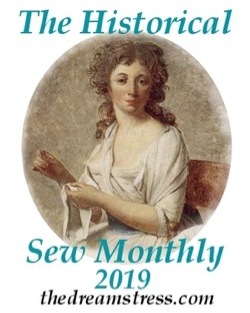 I don’t do mine with double fold bias – I do it with fairly wide bias strips (7cm) folded in half wrong sides together, pressed, sewn raw edges to raw edge on the front of the corset, and then folded over to the back of the corset and hand sewn down. 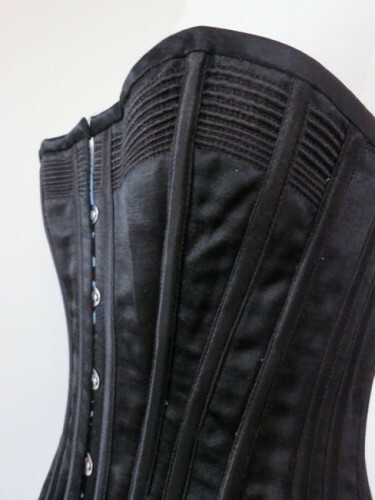 Much stronger and you get a very neat, tidy edge on both sides of the corset. Seems very very strong. Thanks for explaining! Where did you purchase your coutil? That’s by far the least expensive I’ve seen it sold for! 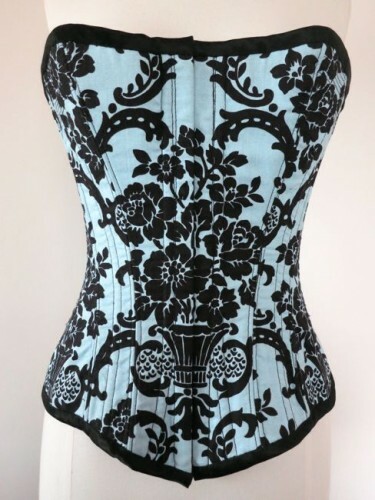 Stunning corset by the way! I actually found the coutil at an op-shop, so finding it that cheaply is not a daily occurrence by any means. And thank you! How did you do the cording? Do you have a tutorial of something similar? Thanks Caitriona. Unfortunately I don’t have a tutorial for the cording. 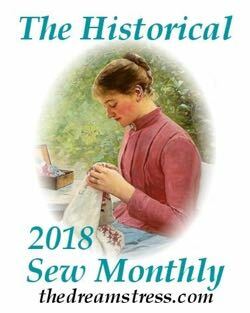 I sew mine in, but pulling the cords in with a needle is also historically accurate (particularly for earlier periods).